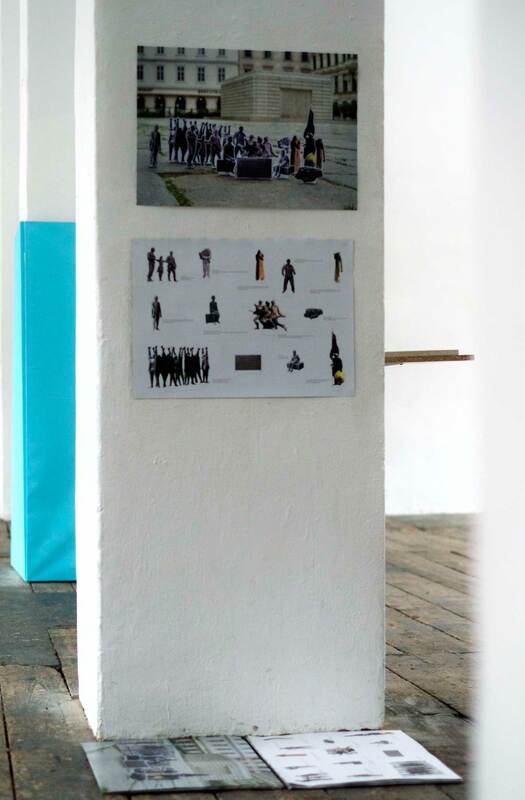 This work was created for the exhibition To One’s Name at Kunsthalle Exnergasse Vienna, curated by Suzana Milevska. It deals with the aesthetics of commemoration as well as with its institutionalization and the relationship of one to the other. The original German title is "1. Hauptversammlung des Komitees zur Erinnerung an das Wort mit dem der Völkermord an Roma und Sinti bezeichnet wird." 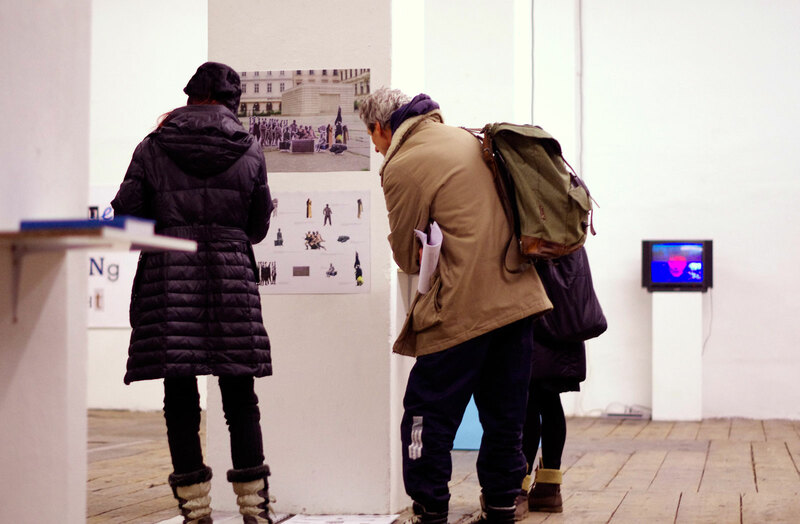 The two-sided poster was presented in the gallery on two piles on the floor and available for take-away. 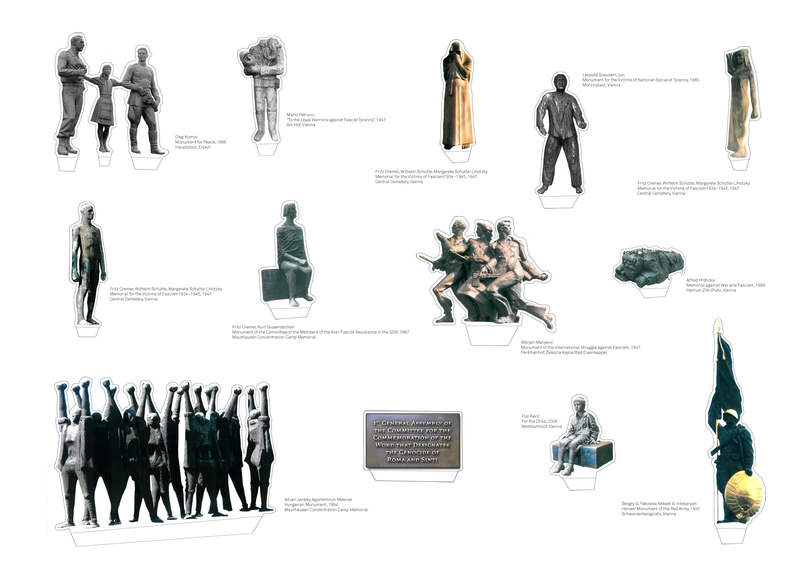 One side depicts 12 figures and a commemoration plaque that can be cut out. The plaque inscription indicates that the group represents the "1st general assembly of the committee for the commemoration of the word that designates the genocide of Roma and Sinti." 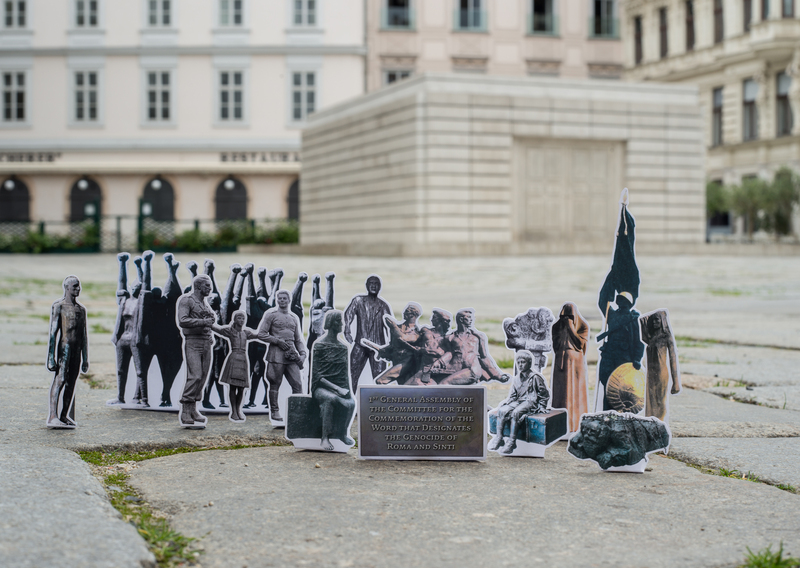 The figures' images are taken from several Austrian monuments dedicated to anti-Fascist resistance fighters, to the allied forces who liberated Austria from Nazism or to victims of the Shoah. Many of these monuments had been debated and extensively contested; some were physically attacked, even got destroyed and had to be re-erected. Their presence is the result of political struggles for the public acknowledgement of victimization and resistance. And their presence in public space, their size and the massiveness of their materials, indicate the successes of those struggles. The longstanding struggle for the acknowledgement of the Nazi genocide of Roma and Sinti has had comparatively little effect. The consequence is a nearly total lack of its commemoration in Austrian public space, a fact that the filigree material of the poster refers to. Certainly, this lack is a symptom of a more general lack, the one of public discourse about the genocide which is indicated in the work by the committee commemorating a term that actually does not exist. The poster’s elements can be cut out and, by using the attached stand, erected at any place and in any arrangement. The spatial settings to commemorate a "neglected genocide" can be created. The backside of the poster shows such a setting against the background of Vienna's Judenplatz Holocaust Memorial (German: Mahnmal für die 65.000 ermordeten österreichischen Juden und Jüdinnen der Shoah) by Rachel Whiteread. The memorial was opened in 2000 and is the result of a decade-long struggle for a monument dedicated to the victims of the Shoah in Austria. Photo at Judenplatz taken by Tal Adler.